The Canadian Experience Class ( CEC ) was created to help people like this take part in the Canadian economy. This video talks about the Canadian Experience Class. 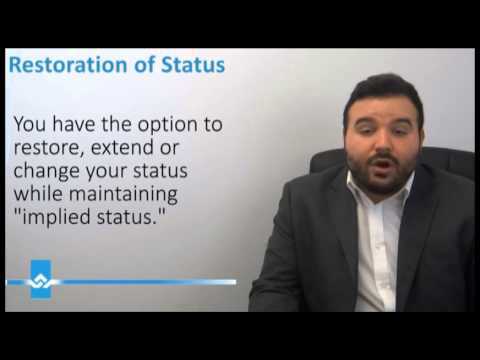 The video outlines how you can qualify under the Canadian Experience Class and what your rights and responsibilities are. The Canadian Experience Class (CEC) was created to help people who have at least 12 months of full-time, or equal amount in part-time, skilled work experience to apply for Permanent Residence. 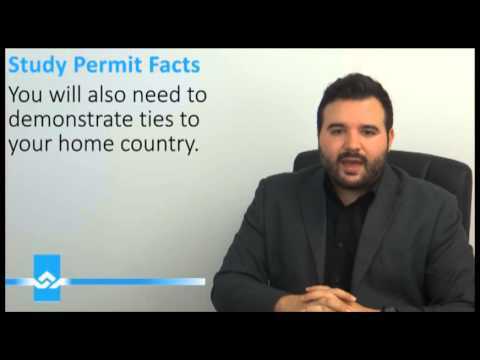 The video also discusses the essential documents needed as well as the Bridging Open Work Permit. 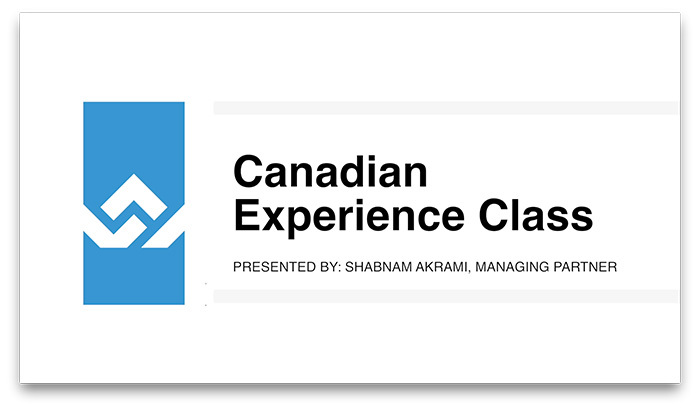 For additional information on the Canadian Experience Class, please check out our website. CEC How We Can Help ! If you like video please subscribe to our channel! 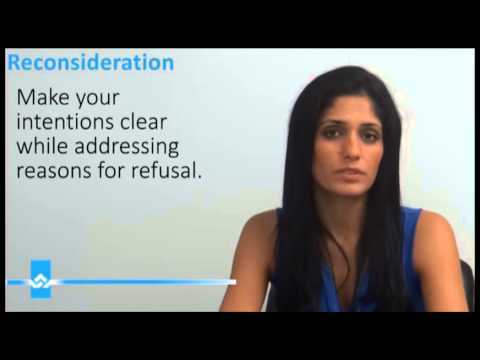 If your application has been refused and you wish to file an appeal, watch our video to learn how to be successful and what the process might be for you. Every year, millions of people visit Canada for many reasons. If you are intending on travelling to Canada for business reasons, you may qualify as a Business Visitor depending on your intended purpose in Canada. A Business Visitor is someone who enters Canada on business purposes but does not actually enter the Canadian Labour Market. Instead, their activities are related to international business.. 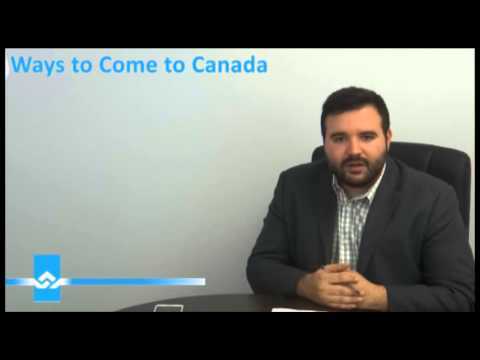 This video is created for those clients who are planning to visit Canada. In order to visit Canada, citizens of certain countries require a Visitor Visa or a TRV. 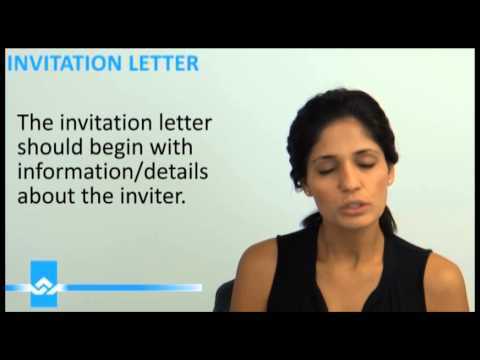 This video will outline the basic requirements as well as some key documentations such as the invitation letter. For additional information on Visitor Visas, please click here. If you are inadmissible to Canada, you will need a Temporary Resident Permit to facilitate your urgent travel need. Watch our video for more details. If you have an urgent travel need, an Entry Letter might be the way to help you overcome any issues you may face at the border. Watch our video and find our how! The Super Visa is a special visa for parents and grandparents of Canadian Citizens and Permanent Residence. 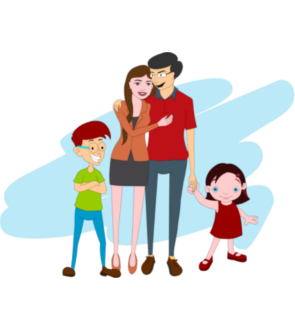 If you want to invite your parents and grandparents, find out what your responsibilities are! Sponsoring your loved one to Canada can be a complicated matter depending on your unique situation. It is never too early to start the process. Watch our video for details. Have questions about next steps on your spousal sponsorship or not sure of whether to file from inside or outside Canada, watch our video to learn the pros and cons of each option. If you have fallen our of status, you have ninety days to do something about it. Watch our video to learn more about Restoration. If you have received your nomination or are interested as applying for a provincial nomination, watch our video to learn about a few things to consider before you make your move to Canada! 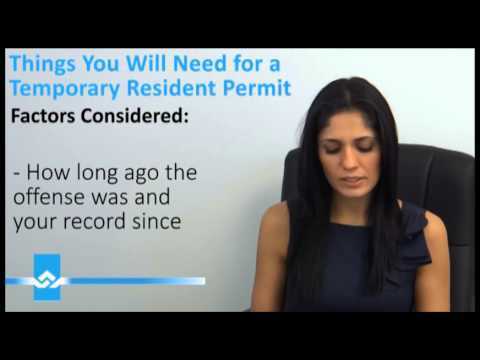 There are specific requirements in order to renew your Permanent Resident Card. 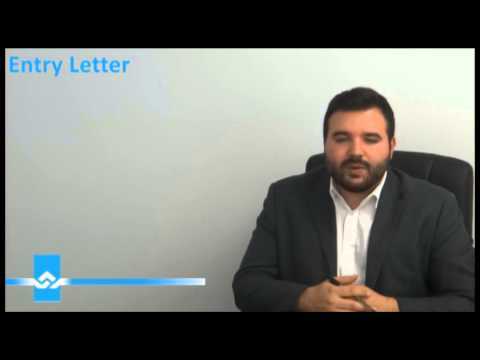 Watch our video to learn what you will need to do. Depending on what you are applying for, you may have to meet certain income requirements in order to qualify. This movie will talk about some of those requirements and how to demonstrate those requirements. 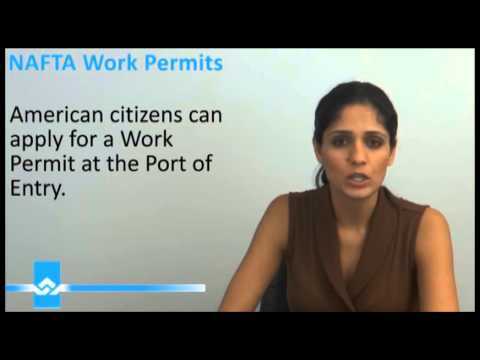 To get an open work permit, you will need to meet certain requirements. It is not for everyone. 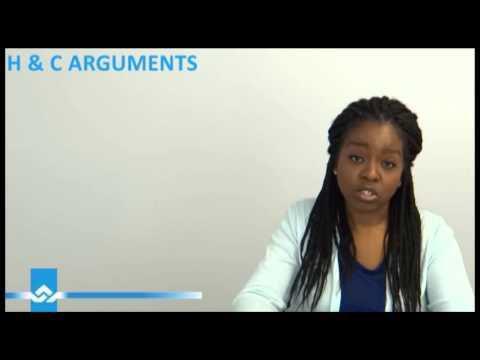 To find out if it is right for you, watch our video! In 2015, The Live in Caregiver Program went through a great deal of change. Watch our video to learn more about these changes! If you are interested in working in Canada is a Caregiver, there are a number of changes that recently came into effect. 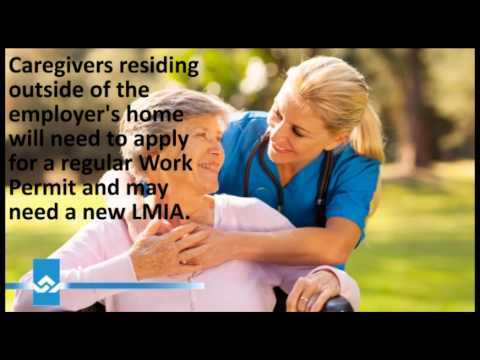 Watch our video to find out how you might qualify under the new Caregiver program! If you are separated from your loved on and wish to sponsor them through conjugal sponsorship, watch our video to find out how! If you have ever had a previous criminality, you may be considered inadmissible to Canada! Find out how you can permanently overcome this through an application for Criminal Rehabilitation! The Federal Skilled Trades (FST) category of permanent residence is geared to towards foreign skilled trades people with experience in eligible occupations. Eligible trades workers, based on their education, experience and occupation may obtain permanent resident status in Canada. This category seeks to facilitate this transition while filling labour shortages that exist in the Canadian labour market. 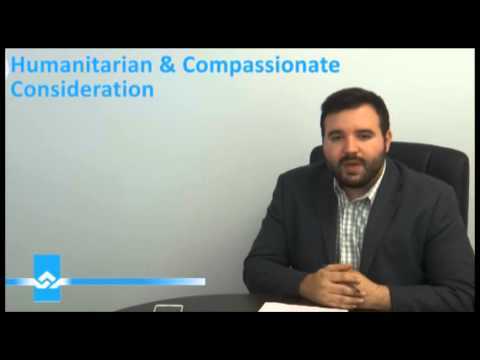 This video is about Humanitarian And Compassionate Considerations. H & C applications are for people without legal status and with no other options available to them. Some important factors for having a successful application under H & C grounds is explained in this video. If you have questions about your options, we can sort them out for you. Our immigration analysis will provide you with an outline of your options to Canada. If you are interested in working in Canada is a Caregiver, there are a number of changes that recently came into effect. 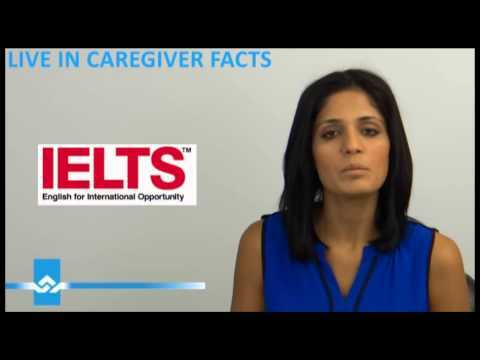 Watch our video to find out how you might qualify under the new Caregiver program! The North American Free Trade Agreement facilitates easy access for Canada, the USA and Mexico. 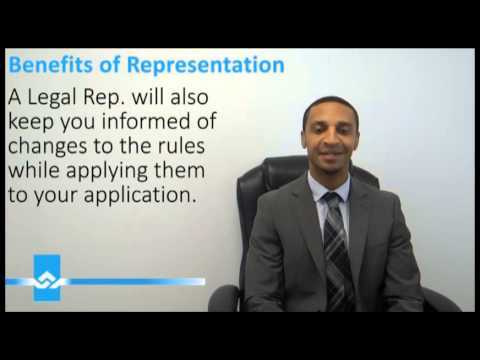 Watch our video to learn how this might apply to you! If you have ever ventured to the border and been denied, or are simply aware that you are considered inadmissible to Canada; you know that additional documentation will be required if you intend on entering Canada. Reasons for denied entry may include past criminal offences, health risks to Canadian citizens or permanent residents, lack of financial resources or inconsistent documentation presented at the border. With our "Do it Yourself Kits" you can complete your application like a pro! 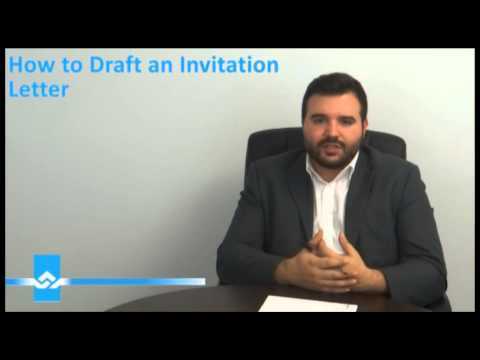 Watch our video to learn how we can help you submit your own application! If you wish to apply for permanent residence and have a year of skilled work experience, you may qualify through the Express Entry Canadian Experience Class Route!. If you want to sponsor your loved one, you will need to understand the difference between spousal, common law and conjugal relationships. 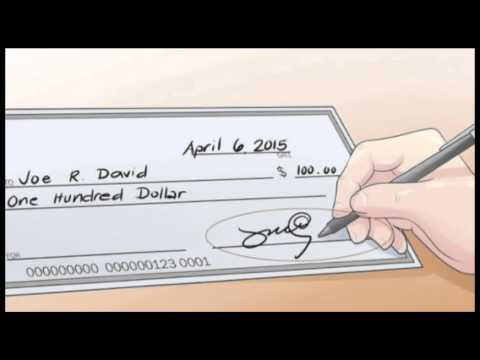 Watch our video to find our how you may qualify. Canada chooses Federal skilled workers (FSW) to become permanent residents based on their ability to settle in Canada and take part in our economy. 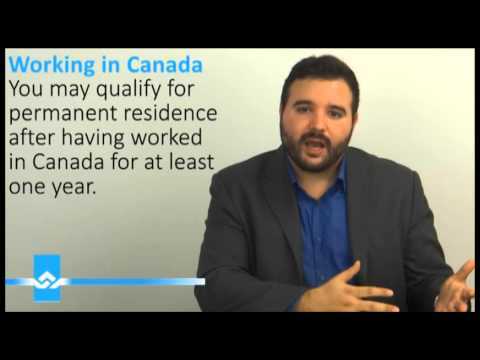 In this video you will learn how you can qualify for Permanent Residence if your work experience is on the recognized eligible occupation list. For additional information on Federal Skilled Worker Program please check bellow. 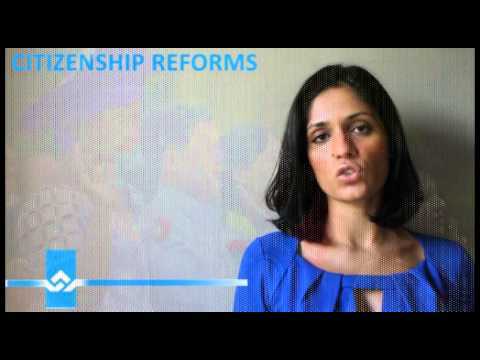 In order to apply for Canadian Citizenship you must meet the residency requirements. 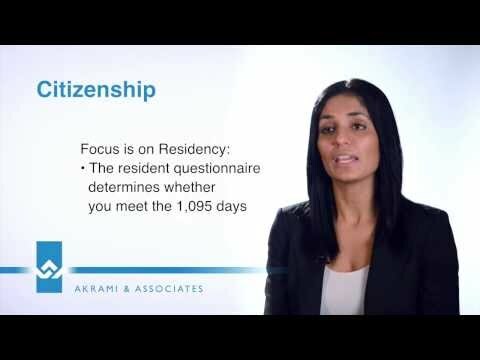 Watch our immigration videos below and see if you meet the residency requirements to become a Canadian citizen. Furthermore, you will learn what documents you need to include in your application, how you can successfully pass the citizenship test and what to expect once you have completed the citizenship test. As you know there are a number of ways to immigrate to Canada it can be from temporary to permanent stay in Canada. If you are unsure of what route will work best for you then watch our Canadian Immigration videos below that gives you some ideas of what routes are available to immigrate to Canada. 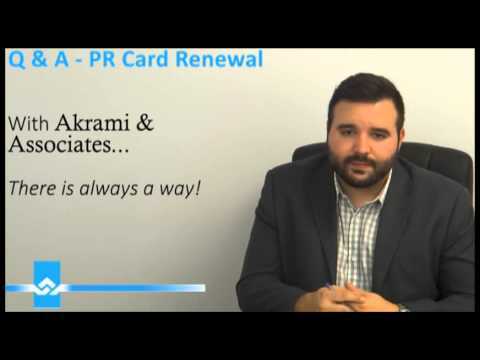 If you are still unsure feel free to contact us at Akrami & Associates and we will help you determine the best route for you. Don't forget to watch our other Canadian immigration videos if you decide to take a particular route to coming to Canada. 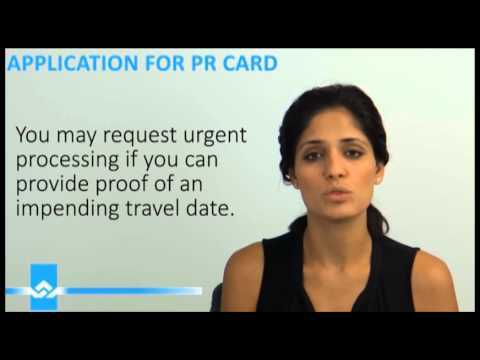 The permanent resident card (PR card) is a card that proofs you are permanent resident of Canada. If you have an expired PR card and left Canada for either employment, family emergency or whatever other reason it might be and wish to return to Canada then watch our PR Card Renewal Videos below on what grounds you can return to Canada and the application process for renewing your PR card. There are many reason immigration officers can deny you entry at the border ranging from criminal offences, possible health risk to Canadian citizens or not having a valid reason of what your purpose of visit is to Canada. 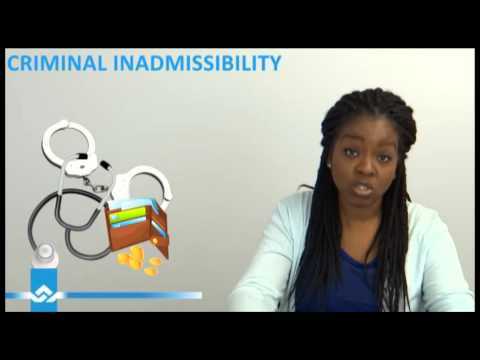 If you have been deemed inadmissible to Canada and are simply unaware of why you are considered inadmissible then watch our Canadian immigration videos and find out why Canada can deny you entry. 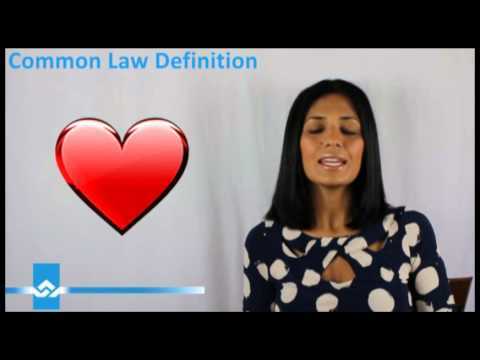 A Common-Law relationship is one in which two people live together but are not legally married to each other. According to Citizenship and Immigration Canada to be considered under the Common-Law relationship the couple must live together in a 'marriage-like' relationship for one year without any long periods of separation, for example, by sharing finances. If you want to sponsor a Common-Law partner to Canada watch our videos and see if you fall under the Common-Law definition and what Immigration Canada looks for in order for you to qualify to sponsor a loved one. Conjugal Relationship is when both partners cant get married, reside together or be in a Common-Law relationship. 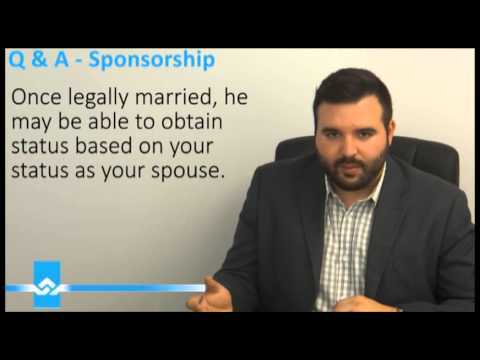 If you are looking into sponsoring your spouse to Canada but unable to do so due to the grounds that limits you then watch our Canadian Immigration videos on Conjugal Sponsorship and learn how you can demonstrate you are in Conjugal relationship to Citizenship & Immigration Canada. 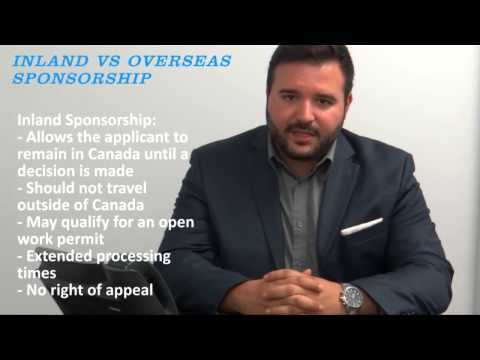 Are you a Canadian citizen or Permanent Resident of Canada and looking into sponsoring your foreign spouse to Canada but unsure where to start? 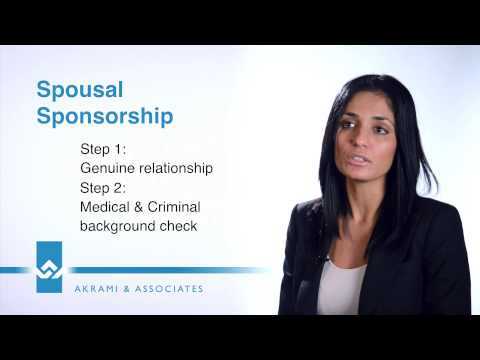 Look no further, below you can find our Canadian Immigration videos on Spousal Sponsorship and steps you can take to sponsor your loved one to Canada. We understand sponsoring your loved one to Canada can be a complicated matter but worry not our Canadian Immigration videos are made easy to understand and how you can file Spousal Sponsorship application and what the eligibility criteria's are to be a qualified candidate. There are many ways to immigrating to Canada, one way would be through the Economic Class. Through the Economic Class immigrants are chosen for their skills and abilities to contribute to Canada's economy. The Economic Class has a broad range of categories such as the Provincial Nominee Program, Federal Skilled Worker Program, Federal Skilled Arranged Employment, Federal Skilled Trades Program, Canadian Experience Class and Live in Caregiver Program. 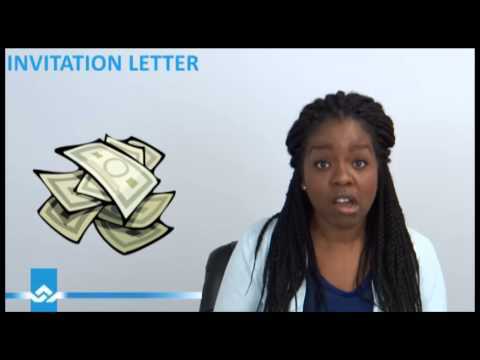 To learn how you can get selected under the Economic Class watch our Canadian Economic Class videos below to see if you meet the eligibility criteria set by Immigration Canada. Don't forget to watch our videos on the above mentioned categories that discusses the topics in detail. Intra-Company Transferee is when a company decides to send one or more of their staff members to work temporarily in different office or country. If you intend on applying as an Intra-Company Transferee as the applicant their are certain requirements you have to meet to be able to work in Canada. 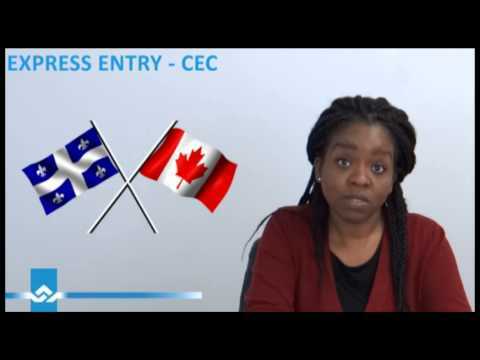 Watch our Intra-Company Transferee videos below to see if you meet the eligibility criteria to submit a successful application to Immigration Canada. Are you a foreign national who wants to work in Canada? If so, the employer must get a Labour Market Impact Assessment (LMIA) before hiring a foreign worker. Therefore, as the foreign national if you wish to work in Canada you should learn about the requirements and steps your future employer must take before considering to hire a foreign worker. 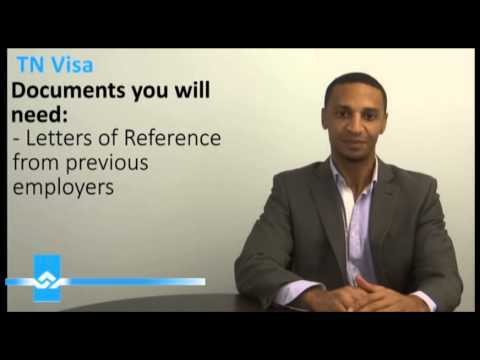 Watching our Canadian Immigration videos below you will learn what steps the employer and the foreign worker must take before being eligible to work in Canada. Are you looking into doing business in Canada, then you may qualify under the North American Free Trade Agreement (NAFTA) which lets citizens of Canada, United States and Mexico gain quick entry into each other’s countries for temporary business or investment reasons. 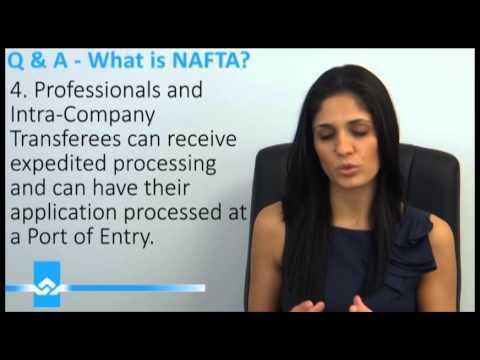 If you like to see if you qualify under this category and need a Work Permit then watch our Canadian Immigration videos below to see if you meet the eligibility criteria and how you can file your NAFTA Work Permit application. Are you a foreign worker and looking into working in Canada? If so, then you need a Work Permit. A Work Permit is legal document given by the Canadian Immigration office that allows you to temporarily work in Canada as foreigner. 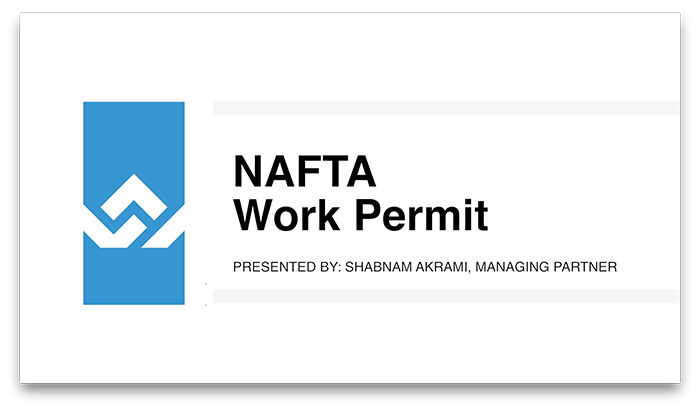 There are different types of Work Permits such as the NAFTA Work Permit, Open Work Permit, Live in Caregiver Work Permit and other types of work permit. In here we will specifically focus on what a Work Permit is, qualification factors to obtain Work Permit in Canada, how to file a Work Permit application to Immigration Canada and much more. If you wish to obtain a Canadian Open Work Permit as the applicant you must meet certain criteria to qualify under the Open Work Permit category. 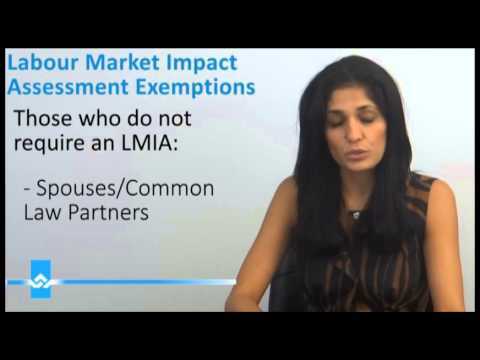 The Open Work Permit is a permit that is not job-specific, because it's not job-specific you do not need a Labour Market Impact Assessment (LMIA) from the employer. 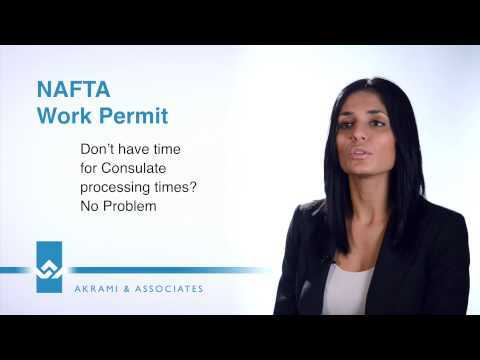 Watch our Canadian Immigration videos below and learn under what program you can be eligible to obtain a Open Work Permit. Are you interested in studying in Canada? If so, then you need to apply for a Canadian Study Permit. In order to apply for Study Permit you need to meet certain eligibility criteria set by Immigration Canada to qualify under this category. 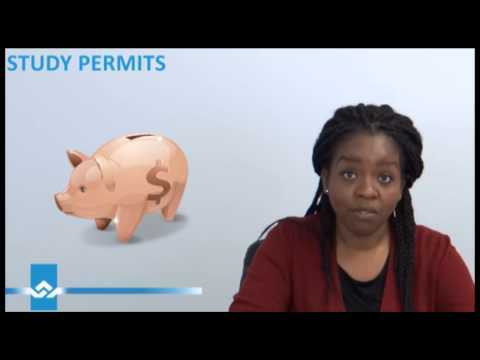 Watch our Canadian Immigration videos below on Study Permits and learn what you can do to be an eligible applicant and the process involved to obtain a Canadian Study Permit. The Super Visa is a temporary resident permit that allows parents and grandparents of Canadian citizens or Permanent Residents to stay in Canada for up to 2 years per visit until the 10 year validity of the permit expires. 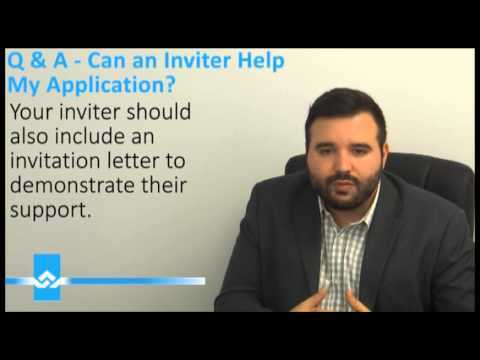 If you want to invite your parents or grandparents, then find out what your responsibilities are as the sponsor, what supporting documents you need to show to Immigration Canada, what the eligibility criteria is to obtain Super Visa and much more. Every year, over 35 million people visit Canada. Some for travel and leisure, others to visit family. Whatever your reason is, you may require the proper documentation to enter Canada. If you come from a country which is considered to be visa exempt, you may not require a visitor visa (temporary resident visa). However, those who do not come from visa exempt countries will need to fist obtain this visa before they can even board a plane to Canada. Below you can find videos on General Immigration matters that can range from how you can come to Canada, how to submit Canadian immigration applications, what immigration Canada looks for to become a permanent or temporary resident and supporting documents you need to show an immigration officer and much more. 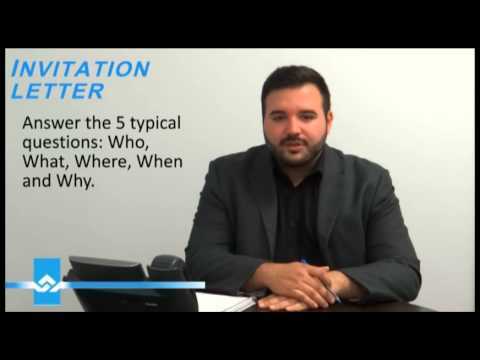 If there is a particular matter or route you are interested in seeking information on then please do watch our other Canadian Immigration videos on our website. Are you looking into travelling to Canada for leisure or business purposes but have been Denied Entry to Canada due to criminal convictions and as a result considered deemed inadmissible to Canada? Watching our Canadian Immigration videos you will learn how you can overcome your criminal inadmissibility to Canada such as understanding what is considered a criminal offense in Canada, if Criminal Rehabilitation is needed and what documents you can provide to the immigration officer to show you have been rehabilitated. The Federal Skilled Trades (FST) category of Permanent Residence is geared to towards Foreign Skilled Trades people with experience in eligible occupations. Eligible trades workers, based on their education, experience and occupation may obtain Permanent Resident status in Canada. This category seeks to facilitate this transition while filling labour shortages that exist in the Canadian labour market. 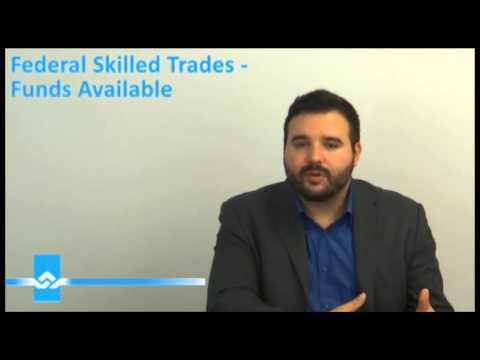 Our Canadian Immigration videos on Federal Skilled Trades will help you determine what the job requirements are to be eligible under Federal Skilled Trades category and what you can do to have successful application to obtain Permanent Resident status in Canada. Every year, millions of people visit Canada for many reasons. 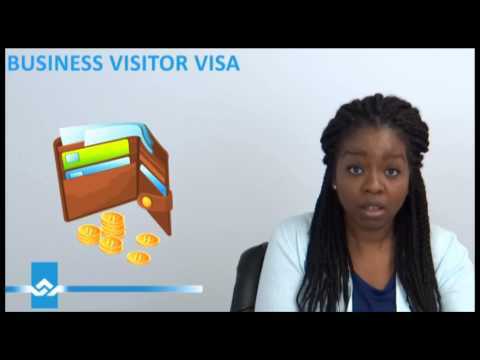 If you are intending on travelling to Canada for business reasons, you may qualify as a Business Visitor depending on the reasons for your visit. 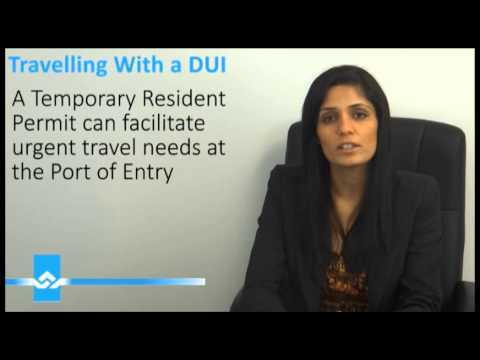 Watching these videos you will learn more about what a Business Visitor is, what you can expect as a Business Visitor, what documents you will need to show to Immigration Canada (CIC) to qualify as a Business Visitor and what to expect at the Canadian port of entry when visiting Canada as a Business Visitor. The Canadian Experience Class (CEC) is an immigration category for Canada's temporary foreign workers who wish to become Permanent Residents. 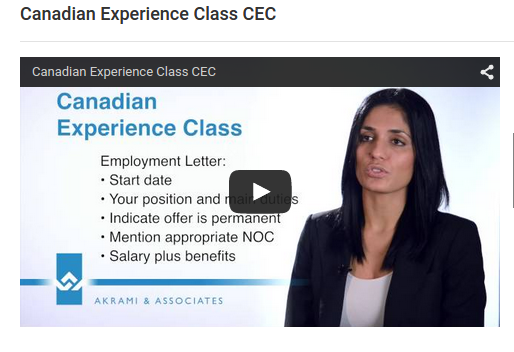 The Canadian Experience Class videos outline what the application requirements are, what documentation you need to show Immigration Canada to qualify under the Canadian Experience Class and what our immigration experts can do to help you achieve your goals. Citizenship and Immigration Canada has launched a new program called the Express Entry to increase economic stability to immigration. The Express Entry is the new electronic online system that is designed to select skilled workers for immigration to Canada. The Express Entry allows Citizenship and Immigration Canada to actively recruit, assess and select immigrants that qualify under the economic programs. If you like to learn more about the Express Entry Route or need help with submitting your application on the portal then watch our Canadian Immigration videos. 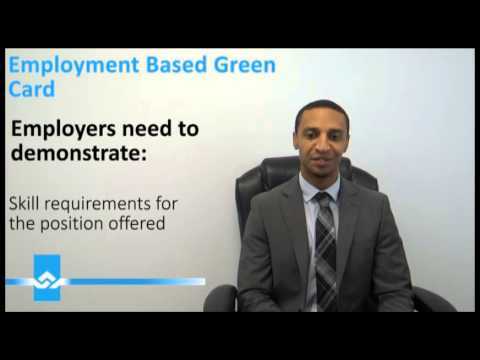 These videos will help you determine under what economic program you qualify and what documentation you can provide to have a successful application and be selected from the pool of candidates. 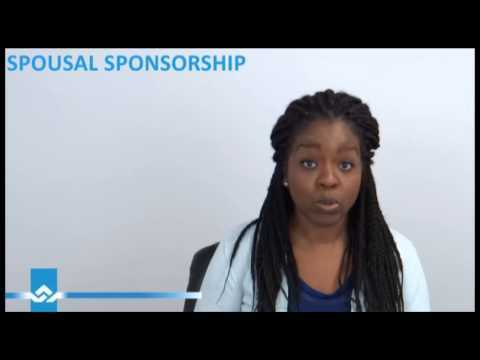 Are you looking into sponsoring a loved one to Canada then watch our Family Class Sponsorship videos and find out the eligibility criteria for sponsoring a family member to Canada. 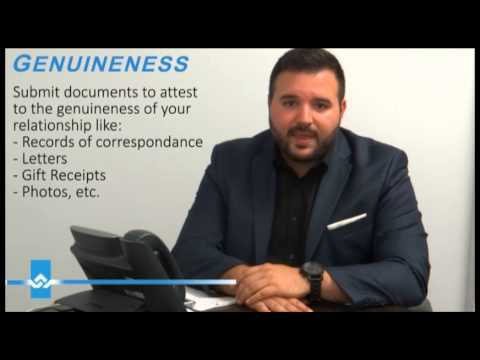 Our Canadian Immigration videos help prepare you with what types of questions to expect during a sponsorship interview, what documents you need to include to have a successful application, whether you should file inland or overseas and much more. Canada chooses Federal Skilled Workers (FSW) to become Permanent Residents based on their ability to settle in Canada and take part in our economy. 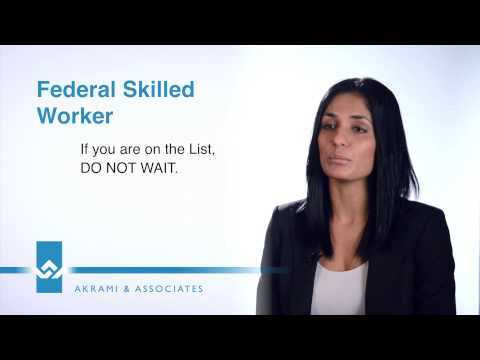 Our immigration videos below discusses the requirements you need to meet to be eligible under Federal Skilled Worker category and how you can determine if your work experience is on the eligible occupation list. Are you looking into immigrating to Canada and unsure whether you should do it yourself or hire a representative to assist you in your immigration to Canada? Filing your own application can be quite a headache or a stressful situation for most applicants. 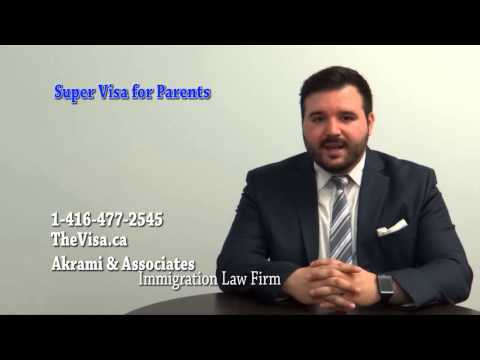 Watch our Canadian Immigration videos below and find out the many benefits you will receive when you Hire a Immigration Lawyer to submit your application on your behalf. Are you an immigrant and seeking permission to stay in Canada? Then perhaps submitting Humanitarian & Compassionate application could be for you. Watch our Canadian Immigration videos on Humanitarian & Compassionate consideration and see if you can qualify under this category to remain in Canada. Live-in Caregivers are individuals who are qualified to provide care for children, elderly persons or persons with disabilities in private homes without supervision. Live-in Caregivers must live in the private home where they work in Canada. 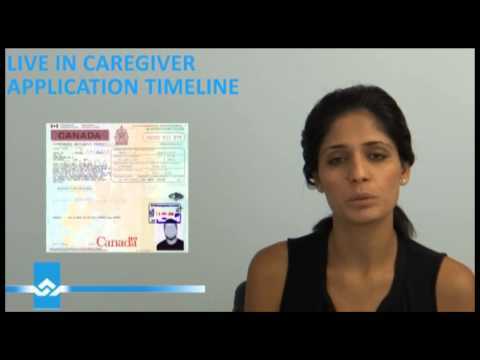 If you wish to work in Canada as Live-in Caregiver and need a Work Permit then watch our Live-in Caregiver Work Permit videos below. 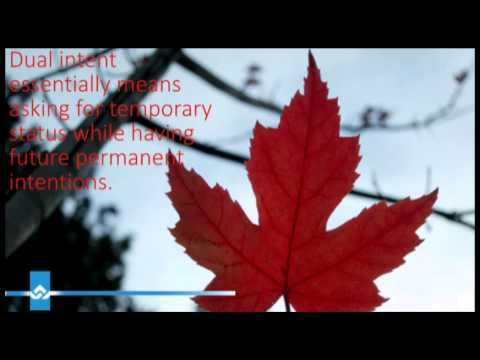 Our immigration videos below discusses on how you can obtain Permanent Residency in Canada as Live-in Caregiver and what Immigration Canada looks for to qualify under this category. A Permanent Resident is someone who has been given Permanent Resident status by immigrating to Canada under a program category such as the Family Class Sponsorship, Economic Class or the Business Immigration category, but is not a Canadian citizen. 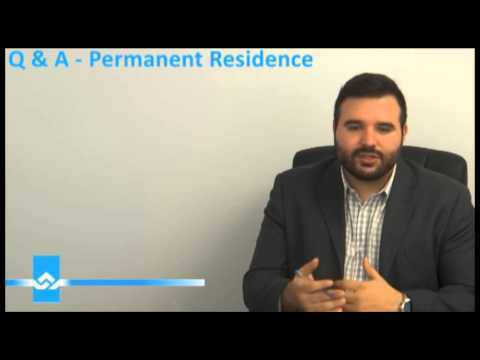 If you wish to live in Canada and want to know how you can obtain Permanent Residence status in Canada then watch our Permanent Residence Videos below on how you can get submit a successful application to Immigration Canada to get selected for Permanent Residency. If you want to become a Permanent Residence of Canada then perhaps the Provincial Nominee Program (PNP) may be for you. Most provinces and territories in Canada can nominate immigrants through the Provincial Nominee Program (PNP). In order to qualify under the Provincial Nominee Program as the immigrant you need to have the skills, education, and work experience to contribute to the economy of that province or territory, and must want to live there. If you have received your nomination or are interested in applying for a provincial nomination, watch our Provincial Nominee Program videos below on you get nominated by the province and selected by Immigration Canada for Permanent Residency. There could be many reason you can be Denied Entry to Canada, such as criminal inadmissibility, medical inadmissibility or non compliance. 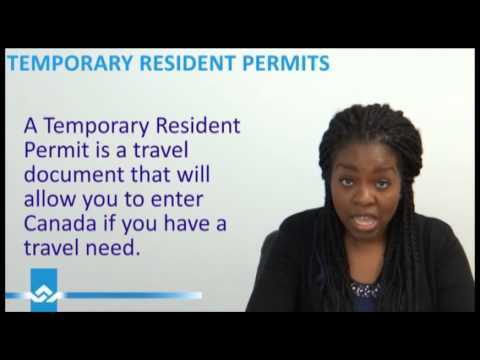 One way you can overcome your inadmissibility to Canada is by applying for Temporary Resident Permit (TRP). To be eligible for a TRP, you must demonstrate to the Canadian Immigration officer that your need to stay or enter in Canada outweighs the health or safety risks to Canadian citizens. Even if the reasons for your inadmissibility seems minor, you must still demonstrate to Canadian Immigration officer that you are not a risk to Canadian citizens. 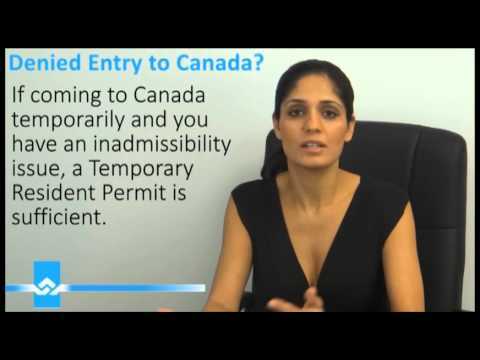 To help you overcome your inadmissibility to Canada watch our Temporary Resident Videos on how you can submit a successful TRP application to Immigration Canada to overcome your criminal inadmissibility. A Visitor Visa also known as the Temporary Resident Visa (TRV) is an official document issued by a Canadian visa office that shows you have met the requirements for admissions to Canada as a temporary resident. 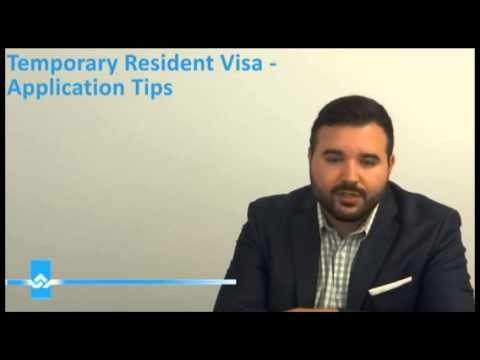 If you are visiting Canada for leisure or reconnecting with family members than you will need a Visitor Visa. In order to qualify for a Visitor Visa you need to meet certain requirements set by Immigration Canada. 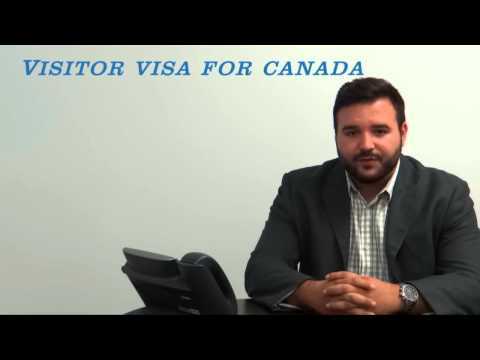 Watch our Visitor Visa videos below on how you can submit a successful application to Immigration Canada to obtain a TRV. 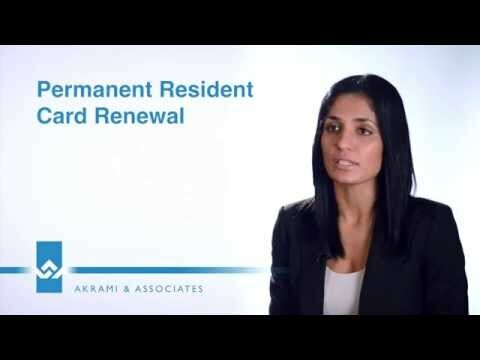 If you received a removal order from Immigration Canada and want to return then most likely you will need an Authorization to Return to Canada (ARC). 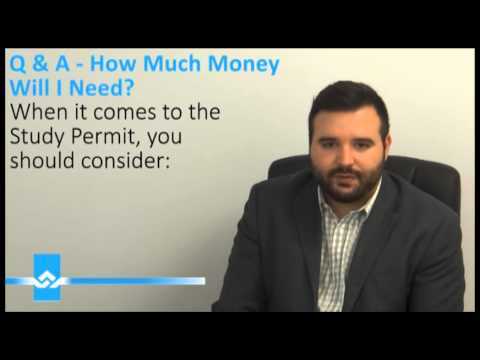 Whether you need one depends on the type of removal order that was issued by Immigration Canada. 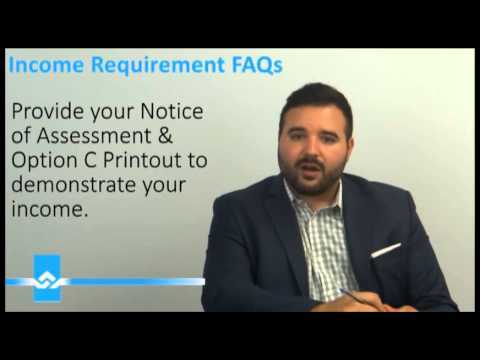 Watch our Canadian Immigration videos below and learn about what removal order you have been subjected to and what supporting documentation you need to include with your Authorization to Return to Canada application. Federal Skilled Arranged Employment is a category for skilled workers who want to immigrate to Canada to work and stay permanently. In order to qualify under this category you need to have a employer that is willing to hire you. The company that hires you will be responsible for taking over your application so that you may become a qualified candidate to immigrate to Canada. 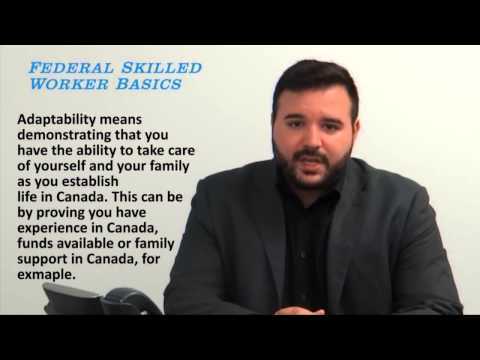 To learn more about Federal Skilled Arranged Employment watch our Canadian Immigration videos below and learn what conditions the employer has to meet and what the eligibility criteria is for the applicant to receive Permanent Residence status in Canada. Canada has one of the most generous family reunification, each year Citizenship and Immigration Canada welcomes 5000 new applicants to Canada. If you are Canadian citizen or Permanent Resident of Canada and wish to sponsor your parents or grandparents to Canada then watch our Canadian Immigration videos below and see if you meet the criteria for sponsoring your parents to Canada. Are you an international student and wish to work in Canada while studying? If so, then the Off Campus Work Permit may be for you. The Off Campus Work Permit is designed for international students who wish to work in Canada. The permit allows the students to work off campus while studying in Canada. 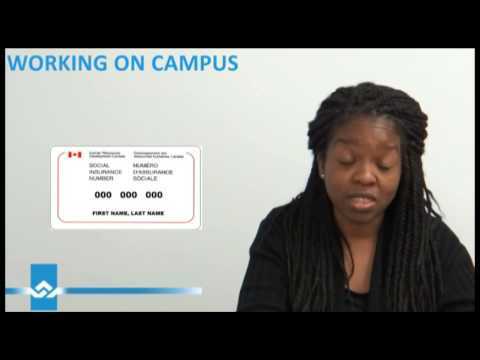 To see if you qualify for the Off Campus Work Permit watch our Canadian Immigration videos below on Off Campus Work Permit and see if you meet the eligibility criteria. Our Do It Yourself Immigration Kits are custom made for anyone that is looking into filing their own immigration application to Citizenship and Immigration Canada. 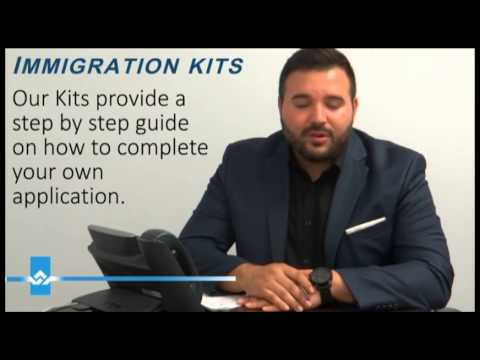 Do It Yourself Immigration Kit is a step-by-step instruction tool that ranges from temporary to permanent matters to help you complete your own immigration application like a pro! 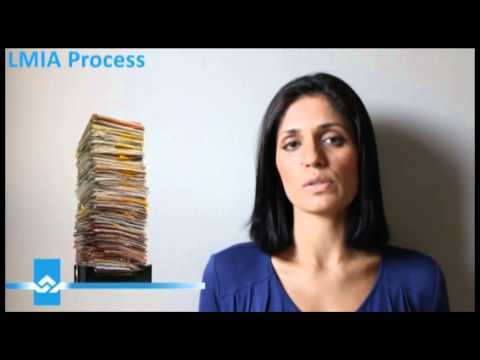 If you like to save money then watch our Do It Yourself Immigration Kit videos and learn how you can submit your own application to Immigration Canada. The Alberta Immigrant Nominee Program (AINP) is an economic immigration program operated by the Government of Alberta that supports Alberta's economic growth by attracting and retaining foreign immigrants that are ready to work in Alberta. If you like to know how you can get nominated by the government of Alberta through Citizenship and Immigration Canada (CIC) then watch our Canadian Immigration videos below on AINP to learn more about the selection process involved. The British Columbia Provincial Nominee Program (BC PNP) is an economic immigration program for the province of British Columbia to help create economic development for that province. Through this program the province can select foreign workers and international graduates that have the necessary skills and experience to contribute to British Columbia's economy. If you are an entrepreneur and want to invest in the Canadian economy then you have a great chance to get a Provincial Nomination from the province of British Columbia. Watch our Provincial Nominee Program British Columbia to see how you can get selected by Citizenship and Immigration Canada and how you can submit a successful application to Immigration Canada. The Manitoba Provincial Nominee Program (MPNP) is responsible for selecting skilled immigrants and entrepreneurs to help grow the economy of Manitoba. 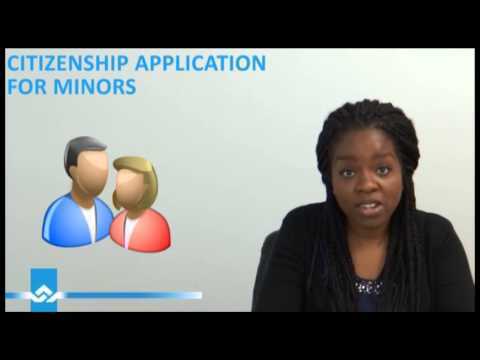 If you like to know how you can get nominated by the province of Manitoba watch Canadian Immigration videos on PNP Manitoba and learn how you can become a successful applicant to get selected by Citizenship and Immigration Canada to obtain permanent residency as a skilled worker or an entrepreneur. The Saskatchewan Immigrant Nominee Program (SINP) is another way to enter Canada for Permanent Residency. In order to qualify under SINP as the applicant you need to have special skills and experience to be nominated by the province. Watch our Saskatchewan Immigrant Nominee Program videos below to learn how you can qualify under the SINP category and be selected by Citizenship and Immigration Canada for permanent residency. The New Brunswick Provincial Nominee Program (NBPNP) is a provincial immigration program to select and nominate business people and skilled foreign workers to work and stay in the province of New Brunswick. If you like to contribute to the economic growth of New Brunswick then watch our Canadian Immigration videos below on you can get nominated by the provinces New Brunswick and selected by Citizenship and Immigration Canada for permanent residency. The Nova Scotia Nominee Program (NSNP) is designed to improve the economic stability of the province of Nova Scotia by selecting skilled workers and experienced entrepreneurs for Permanent Residency. If you like to be nominated for the province of Nova Scotia then watch our Canadian Immigration videos below on Nova Scotia Nominee Program and under what streams you can apply to be selected by Immigration Canada for permanent residency. Temporary Residency applies to individuals who are not Canadian citizens but foreign nationals who are legally in Canada for a temporary purpose such as foreign workers, international students and tourists. 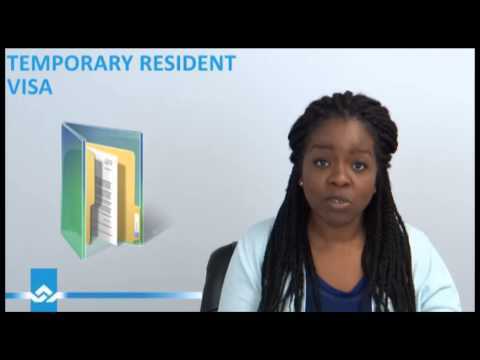 If you are looking for temporary stay in Canada for work, study, or vacation purposes then watch our Temporary Residence videos below on how you can qualify and submit a successful Temporary Residence application to Immigration Canada. The Significant Benefit Work Permit applies to individuals who are entrepreneurs or artist investors. To qualify under this category as the entrepreneur or the artist investor you must demonstrate to Immigration Canada how you will contribute to the Canadian economy to be a successful applicant. 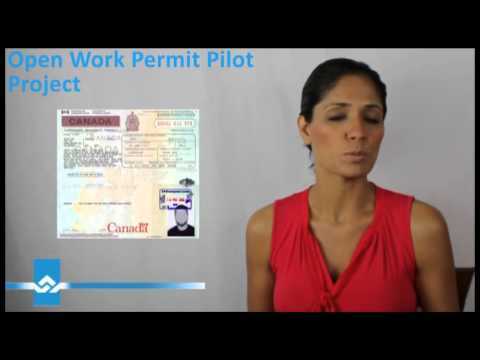 If you like to obtain a Work Permit in Canada as an entrepreneur or artist investor then watch our Significant Benefit Work Permit videos below on how you can submit a successful application to Immigration Canada. Are you a recent graduate from a Canadian Post Secondary Institution and wish to work in Canada? If so, then the Post Graduate Work Permit may apply to you. In order to be eligible for the Post Graduate Work Permit you must meet certain requirements set by Immigration Canada to be a successful applicant. 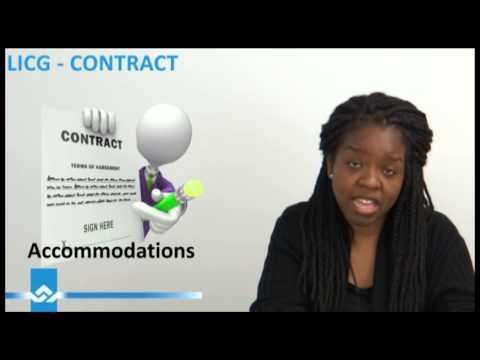 If you like to learn how to obtain a Post Graduate Work Permit then watch our Canadian Immigration videos below to learn how you can meet the requirements and perhaps obtain Permanent Residency in Canada. A Record Suspension also referred to as a pardon allows individuals who were convicted of a criminal offence to keep their criminal record separate from other criminal records as long as they have completed their sentence and demonstrated they are law-abiding citizens for their prescribed period. If you have been convicted of an offense and completed your sentence then you may be eligible for a pardon. 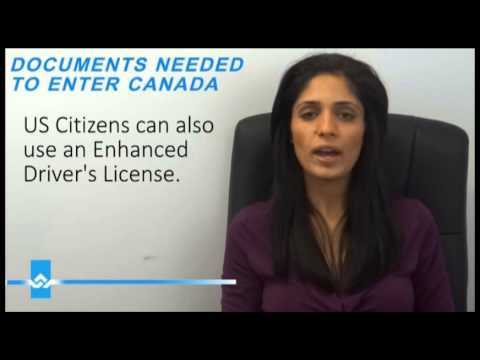 Watch our Canadian Immigration videos on Record Suspension on the eligibility criteria and how you can file your Record Suspension Application or receive a pardon from Immigration Canada and other videos related to the matter. The Youth Mobility Program is an international exchange program that exists between Canada and the foreign countries that have made agreements with Canada to allow young Canadians that have completed their postsecondary studies to work abroad. If you have completed your postsecondary education and like to gain work experience while travelling than the Youth Mobility Program might be right for you. 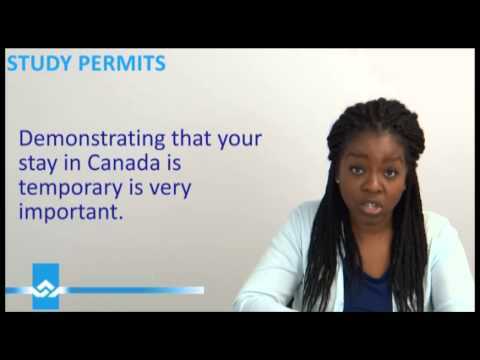 Watch our Canadian Immigration videos on Youth Mobility Program on how you can be eligible to obtain a Work Permit and have a successful Youth Mobility Application. 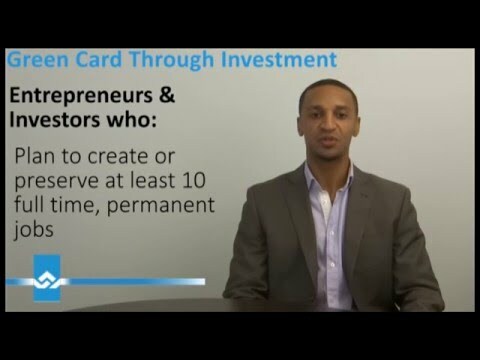 Are you looking into investing or opening up a business in Canada ? If so, then Business Immigration might be for you. The Canadian government likes to select business immigrants who can become economically established in Canada and who can support the development of the Canadian economy. 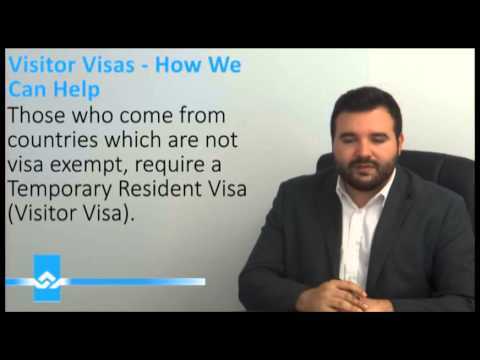 If you like to learn how you can meet the Canadian Immigration eligibility criteria to immigrate to Canada as business immigrant then watch our videos below. Are you looking into obtaining Permanent Residency in Canada and have a high net worth? If so, you may be eligible to qualify for the Federal Investor Program. The Canadian government seeks interest in individuals who can add to the economic development of the country. As the immigrant investor you need to have a minimum of $1.6,000,000 CAD as your net worth and willing to pledge at least $800,000 CAD which is fully refundable at the end of your 5 year term with no interest added to it. If you like to learn more on this category then watch our Canadian Federal Investor Program videos below on how you can meet the eligibility criteria to be selected by Immigration Canada as a successful applicant. Are you self-employed and wish to work in Canada? If so, you may be eligible for the Self-Employed Immigration Program. Canada seeks to bring in immigrants who will be self-employed that have experience in cultural or athletic activities and intend on making contributions to the cultural and athletic life of Canada. If you have experience in farm management and intend on buying and managing a farm in Canada then you can also qualify for Permanent Residency in Canada. 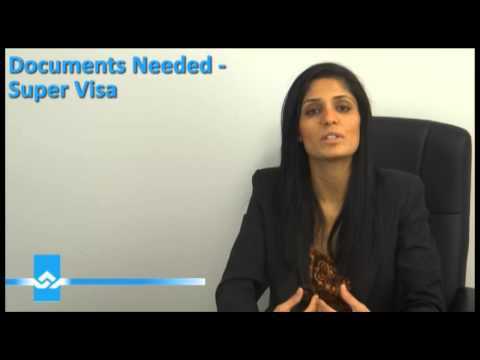 Watch our Self Employed Immigration Videos below on how you can meet the qualification criteria set by Immigration Canada. The Start-up Visa Program is designed to target immigrant entrepreneurs that have innovative business ideas and skills to help create jobs for Canadians. If you have a business idea and have the financial support from an organization than you may be eligible to immigrate to Canada for Permanent Residency. 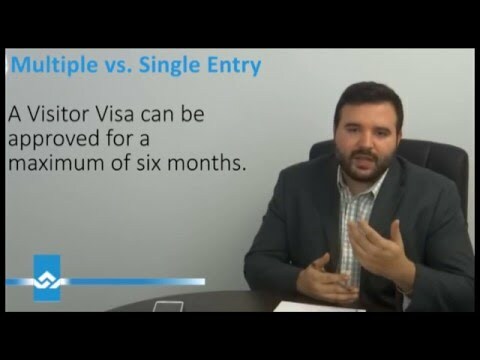 Watch our Start-up Visa videos on how you can meet the eligibility criteria to submit a successful application to Immigration Canada. Are you looking into working in the United States and not sure where to start? 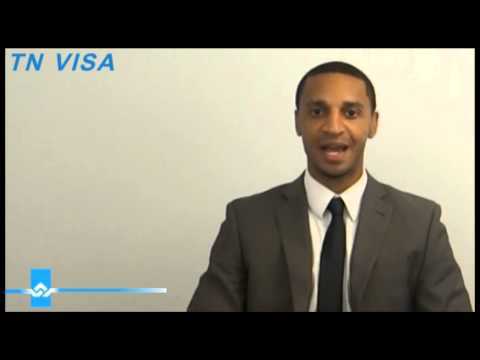 If so, watch our videos below on how you can obtain US Work Visa prior to entering the U.S. labour market. As you know there are many work visas available to you but depending on the nature of your work you need to apply for the correct work visa. 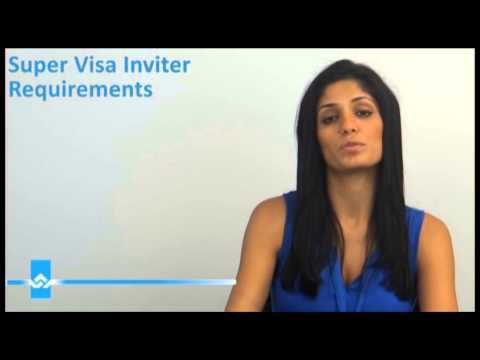 To help you determine which work visa will work best for you watch our Canadian Immigration videos below. Are you a skilled professional that specializing in the fields such as architecture, engineering, science, mathematics or medicine than the H1B Visa might be for you. The H1B Visa is non-immigrant visa that permits US companies to hire foreign workers for long term assignment in the US in the specialty occupations. 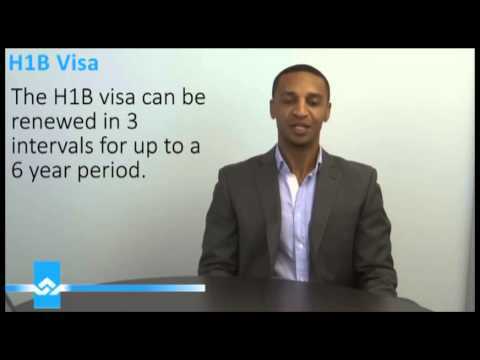 Watch our H1B Visa videos below to see if you meet the eligibility criteria set my the US immigration and how you can submit a successful application to US Immigration to obtain a H1B Visa. 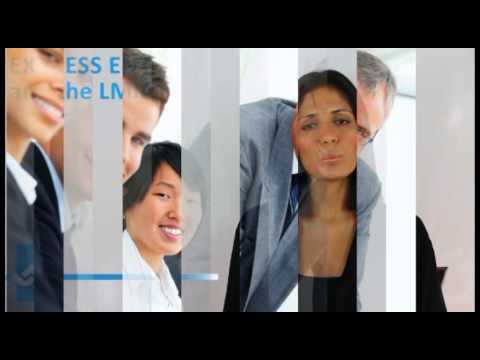 The L1 Visa is for companies that operate both in the US and abroad. If you are an individual who works for a company that operates both in the US and abroad and wishes to transfer to US location then the L1 Visa might be for you. L1 Visa is a non-immigrant visa that permits companies to transfer employees from its foreign home country office to US office for up to seven years. In order to qualify for the L1 Visa as the employee you must have worked one year out of the last three years in either the subsidiary, parent, affiliate or branch office located outside of your US company. 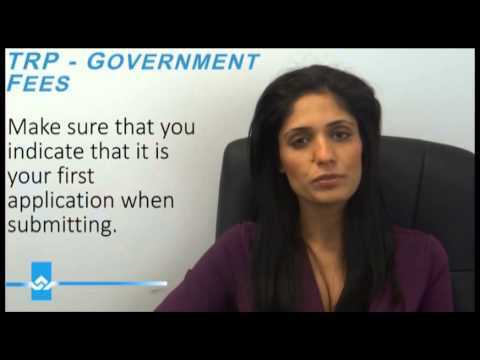 If you like to learn more on what the eligibility criteria is then watch our L1 Visa videos below to submit a successful L1 Visa application US Immigration. The TN Visa also know as The North American Free Trade Agreement (NAFTA) is an agreement between Canada, The United States and Mexico. This agreement is designed for the sole purpose to increase trade among these countries. If you are Canadian or Mexican citizen you may be exempted from submitting a Labour Certification depending on your intended purpose to the United States. 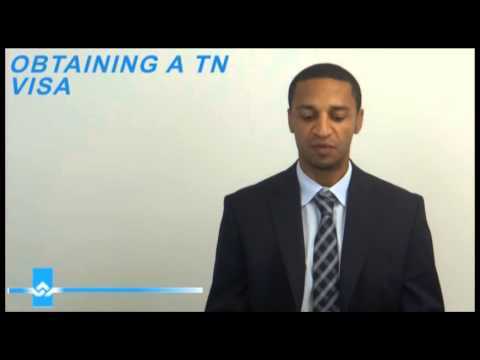 Watch our TN Visa videos below on what documentation you need to submit a proper application to US Immigration to obtain your TN visa. Are you an American citizen or a green card holder and want to sponsor a loved one to United States? 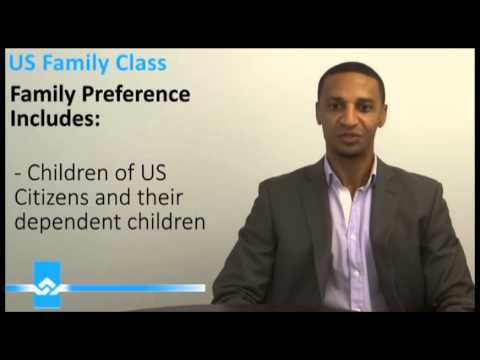 If so, watch our US Family Class Visa videos on the eligibility criteria you have to meet to be able to sponsor your family to U.S. If you need help with your family sponsorship application please don't hesitate to contact us and one of legal representatives will be glad to assist you with your US Immigration matter. 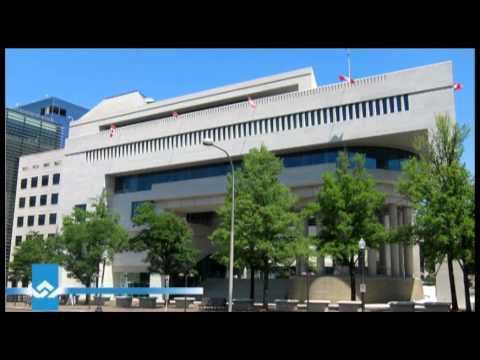 Are you looking into obtaining a US Green Card for permanent residency? You can obtain a Green Card either through a family member or through Employment Based Green Card. 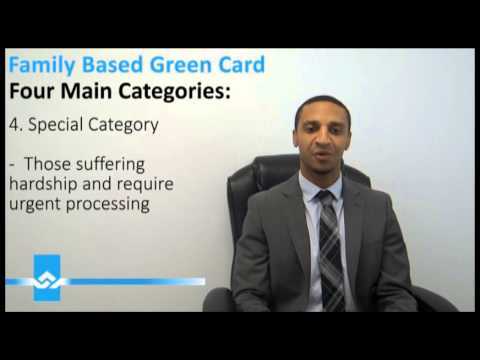 There are different Employment Based Green Cards such as EB-1, EB-2, EB-3 or the EB-4 to help you determine which one you should apply under watch our US immigration videos below to submit a successful application to US Immigration.